In fact more than 450,000 Americans die from cardiac arrest every year. But there is a big disparity in research funding for this killer disease compared to other leading causes of death. We know this because of research led by Ryan Coute, a third-year medical student from Kansas City University of Medicine and Biosciences (KCU). Coute conducted his research as recipient of the distinguished Sarnoff Fellowship at University of Michigan. “Our research tracked the past decade of funding from the National Institutes of Health (NIH) and found that on a per death basis the NIH awards approximately $2,200 for stroke, $2,100 for heart disease but only $91 for cardiac arrest,” Coute said. Cardiac arrest, which is an abrupt loss of a person’s pulse and blood pressure, often leads to death if the victim does not receive treatment quickly. The study, titled NIH-funded Cardiac Arrest Research: A 10-year Trend Analysis, was awarded “Best of the Best” Abstract for Cardiac Resuscitation by the American Heart Association Resuscitation Science Symposium held in New Orleans, La., Nov. 12 and 13. 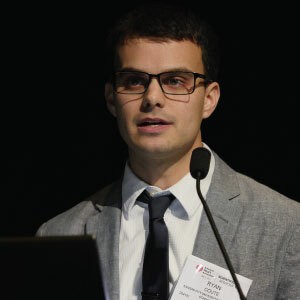 Coute conducted the study during a one-year fellowship sponsored by the Sarnoff Cardiovascular Research Foundation. After graduating from KCU in May of 2018 Coute plans to pursue a career in academic medicine.